Does your company have ultra-low CPC’s or maybe recently smashed a conversion record but didn’t see any benefit to your bottom line? All too often we hear from frustrated marketing managers that despite exceptional Google Ads metrics, they’re not seeing any positive impact to business growth and profit. Optimizing for vanity PPC metrics that provide little tangible benefit to the company can be sending the wrong signals. Strong click and conversion metrics are great to see — but even with a target ROAS strategy, your paid ad campaigns might be headed down a profitless rabbit hole. The number one goal of your Google Ads campaigns should always be to drive business growth. Not impressions, clicks or even conversions. Let’s take a look at a visual representation of maximizing profit without maximizing ROI. 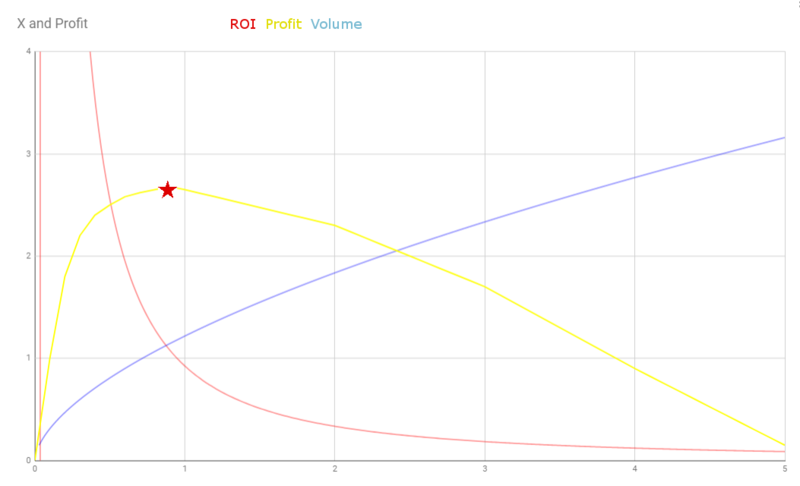 In the graph below, notice that profit is at its highest when ROI and volume intersect. This is due to the additional costs incurred from increasing volume/output. This model forms the core of all the formulas we look at. It’s pretty basic and provides a basis to adapt to each unique business model/industry. Unit economics consists of the direct revenues and costs associated with a particular business model expressed on a per unit basis. Let’s take things a step further and adapt these models to some common business models. Remember, we’re looking to optimize campaigns for profit. While this model primarily uses the formula at its most basic level, some clients stumble on finding the Profit Margin %. Admittedly, if your site offers thousands of products with widely differing profit margins, finding the profit margin may not seem simple. The objective here is to try and find an acceptable average which can be applied to all. Or, if it’s easier, group products into categories and find an acceptable rate for each grouping then apply this model on a categorical level. Let’s look at an example. John’s Aerodynamic Underwear Shop receives $15,000 in sales from AdWords in a given month from an ad spend of $2,500. After accounting for cost of goods and so forth, he determines he makes a 30% profit margin on each pair of underwear sold. Lead generation typically proves to be the most complicated business model to apply the profit model to, but it’s actually where we’ve seen the greatest success. It’s easy to drive false positives with leads, which is why we recommend keeping a close feedback loop with your sales team to ensure a focus on highly qualified leads. Once this is established, the profit model will help steer your AdWords efforts to maximize results. Let’s look at an example. McTalk is a global enterprise telecom company providing IT services to large, multinational companies. They use AdWords to target CIO’s and other high ranking execs looking to modernize their IT infrastructure. CPC’s in this market are incredibly high with an average monthly ad spend of 10K driving just 75 leads. However, the average contract is worth 500K with a 50% profit margin. Due to the scale of these projects, only 1% of these leads meet the requirements to become actual customers. Let’s look at an example. Ultimate Spinners sells subscriptions to receive monthly fidget spinner gift boxes at $19.99 per month. They earn $5 profit (25% of $19.99) on each subscription each month. On an average month they receive 134 new subscriptions from an ad spend of $1,500. They have observed that most customers cancel their subscription after 5 months. Determining which aspects of your campaign are truly driving profit is the first step. But where do you go from here? We recommend building these models into your Google Ads platform so you can have the most up to date data readily available while you’re making your regular account optimizations. Learn how to build custom columns here. The ultimate bottom line: Optimize holistically, not granularly and adopt a growth mindset. Growth should be your top priority with efficiency second. If you have a Google Ads PPC account with DTC, your account manager will be able to help you discuss these profit. If not, we encourage you to reach out. We love talking PPC. Previous Previous post: Does PPC Help SEO?